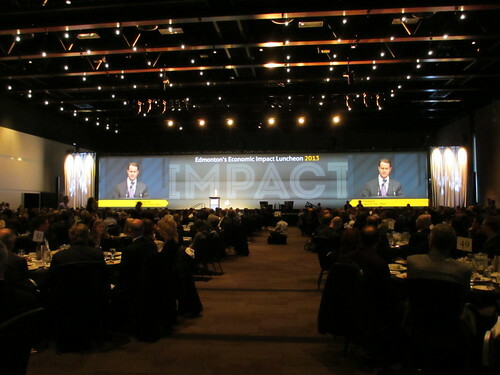 Today more than 900 local leaders filled Hall D at the Shaw Conference Centre for EEDC’s Economic Impact Luncheon. It was Brad Ferguson’s first luncheon as the new CEO of EEDC (you can read my interview with Brad here). Peter Silverstone, Chair of EEDC’s Board of Directors, told us that Brad wanted to go big with the luncheon this year. I think it’s safe to say he delivered, and not just because of the giant screen that dazzled everyone in attendance. The program began with remarks from the Province and City. Minister of Finance Doug Horner was on hand to bring greetings from the provincial government. He sounded positive, declaring that Alberta would remain Canada’s growth leader, but also realistic. “You’ve heard over the past few weeks about the province’s fiscal challenges,” he said. “You’re going to hear more.” Next up was Mayor Stephen Mandel, and he too sounded upbeat, calling Edmonton “the most entrepreneurial city in the country.” Both men talked about the incredible opportunity that Alberta affords. Become the change they want to see in the marketplace, which means being competitive vs. complacent. Bring clarity and confidence in the structure of the organization. Redefine stakeholder relationships within the economic development system. We believe strongly in building a performance-based culture, and will be working throughout 2013 to build a reporting process of transparency and accountability. To build high-performance business units, each division will focus on its objectives, goals, strategies, and measures – a change from the past to a future focused on a new level of predictable performance. 2013 will be a year of transition, new leadership, new processes and new accountabilities. To ensure Edmonton and the Capital Region outperform every major economic jurisdiction in North America consistently over the next 20 years – no matter if the price of oil is $40 or $140. That objective is all Brad, and it speaks to his commitment to competitiveness. Reading through the longer version of the Statement of Intent, it is clear that major change is on the way for EEDC in 2013. The section on EEDC’s divisional approach makes clear that each division, from the Shaw Conference Centre to Edmonton Tourism, must be held accountable and perform well. It also opens the door for one or more of those divisions to leave EEDC, something that has been discussed with growing frequency. “We are organized to maximize operating efficiency, with proactive orientation and resource allocation along with clear exit strategies…” Furthermore, the list of priorities highlights that alignment with the City of Edmonton and an organizational restructuring is on the way. Perhaps EEDC needs to become a leaner organization in order to execute on its new objective (for the record, I believe it does). The guest speaker was former Suncor Energy CEO Rick George. He shared some thoughts on Alberta and the future we have ahead of us. Though he touched on some of the topics discussed in his book, Sun Rise: Suncor, The Oil Sands And The Future Of Energy, he didn’t get into too many details about the oil sands. He did challenge everyone to look far down the road, echoing Brad’s earlier call for a plan for Alberta. Rick described himself as “a hopeless optimist” and said we need both optimism and imagination to succeed. “Without optimism, there’s little room for contrarianism and the outside-the-box thinking needed to turn the corner,” he said. Everyone in attendance took home a copy of Rick’s book. I loved the giant screen and the reorientation of the stage at today’s event. As we ate lunch, images and factoids about Edmonton’s past and present danced across the screen. The event was live-streamed, and it sounds like that was a big success. There was a lot of discussion about the event on Twitter too, using the #yegimpact hashtag, and that always makes these things more interesting. Most of all I enjoyed the refreshing approach that Brad brought to today’s luncheon. Even, measured, realistic, honest. Sure there are plenty of reasons to be optimistic, but that doesn’t mean there aren’t risks. We can’t take our eye off the prize. Want to compare to years past? You can read my recaps of previous EEDC luncheons here: 2012 Annual Luncheon, 2012 Economic Outlook Luncheon, 2011 Annual Luncheon, 2010 Annual Luncheon, 2010 Economic Outlook Luncheon. Keep an eye on this URL for speaking notes, video, and other materials from today’s luncheon. Be sure to follow @EEDC and @EEDC_BRAD on Twitter for updates.